FTW Events, Calliope Games and Cheapass Games are proud to present the Night of Gaming for Good on Top of the World, PAX Edition, benefiting The Imagine Guild for Seattle Children's Hospital! Taking place on the top floor of Seattle's iconic and exclusive Columbia Tower, it's an event you won't want to miss. We are excited to welcome legendary fantasy author Patrick Rothfuss and game designer Gaby "Gabberywocky" Weidling as our guests of honor! Join us for an evening with the gaming community to celebrate and play games we love, partake in fine dining, enjoy Top of the World views, and win gaming raffle prizes. All to support a great cause: our beneficiary, the Imagine Guild, supports the Seattle Children’s Hospital, Uncompensated Care program. This is Friday night during PAX West weekend, though you do not need to attend PAX to join us. However, PAX-goers can consider this a great after-party! This is the highest (publicly accessible) floor west of the Mississippi River! There are a number of reasons to attend, but chief among them is that we'll be gaming for good. The Uncompensated Care program eases the financial burden on parents at Seattle Children's Hospital, allowing them to focus on the most important thing: their child’s health. With today’s unstable healthcare climate, the vulnerable families and kids supported by this program need our assistance more than ever. Meet and pick through the brains of game designers while playing the games they've created! Play all night from our extensive lending library, with a variety of games to suit many tastes and play styles. TYou are also welcome to BYOG or purchase one with vouchers to our pop-up game store. You might even win a game from our raffle, with thousands of dollars worth of gaming and geeky prizes, all generously donated by members of the gaming industry and community! Includes a buffet dinner, a SWAG bag, 2 $10 vouchers to our pop-up game store and all the games you can play! Prices go up for procrastinators, so don't wait too long! New this year: NO SERVICE FEES ON TICKET PRICES! The price you see if the price you pay! Dine in style with guests of honor Patrick Rothfuss and Gaby Weidling. VIP dinner starts at 5:30 so as to not cut into your gaming time. You’ll be served a plated 3-course meal with other VIP ticket guests and VIP industry guests from the gaming community in a private dining and gaming room overlooking the city. The VIP package also includes a premium SWAG bag, 2 drink tickets so you can sip on some geeky-themed cocktails, and a $25 gift certificate to our pop-up game store. Win from thousands of dollars in gaming prizes! Have a great time meeting and playing with other gamers! Meet and pick through the brains of game designers while playing the games they've created! Play from our impressive list of games in our lending library, or bring your own! COSPLAY IS ENCOURAGED! Wear your costume and win prizes for best cosplay. Parking is available at the Columbia Tower for $10 as long as you don't plan to stay past midnight. If you leave the garage after midnight, you will be charged the $10 plus an entire extra day. Please plan accordingly. Street parking is free after 8:00 PM. All proceeds from this event will be donated to The Imagine Guild. The Mission Statement of the Imagine Guild is bringing together the motorcycle community in support of Seattle Children’s Hospital, and their mission is to eliminate childhood illness and injury. The hospital's Uncompensated Care program eases the financial burden on parents, allowing them to focus on the most important thing - their child’s health. With today’s unstable healthcare climate, the vulnerable families and kids supported by this program need our assistance more than ever. We hope you join us in this great cause. Follow us on Facebook to stay updated with what we’re up to! 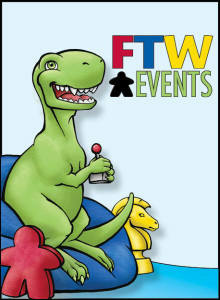 FTW Events is a federal 501(c)(3) non-profit organization that hosts charity gaming events in the Seattle area. All events by FTW Events may be filmed/photographed. By attending, you agree to be photographed and/or filmed and give permission to use your likeness in promotional and/or marketing materials.